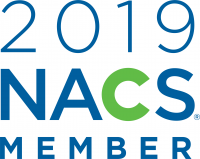 SHOPCO AT NACS 2019 - SHOPCO U.S.A., Inc. If you are attending the NACS 2019 tradeshow please stop by SHOPCO’s booth to see our latest merchandise and say high to our sales team. SHOPCO USA provides the highest quality shelving displays, free standing gondolas, metal cabinets, food service and sales counters for convenience stores. Not to mention our talented and friendly design team will be eager to help you set up the perfect layout for your new convenience store.